Established in 1911 by presidential proclamation, Devils Postpile National Monument protects and preserves the Devils Postpile formation, the 101-foot high Rainbow Falls, and pristine mountain scenery. The Devils Postpile formation is a rare sight in the geologic world and ranks as one of the world’s finest examples of columnar basalt. Its columns tower 60 feet high and display an unusual symmetry. Another wonder is in store just downstream from the Postpile at Rainbow Falls, once called “a gem unique and worthy of its name.” When the sun is overhead, a bright rainbow highlights the spectacular falls. The monument is also a portal to the High Sierra backcountry; some 75% of the monument is included in the Ansel Adams Wilderness. At 800 acres, Devils Postpile National Monument may be considered small by some, yet its natural and recreational values abound. Details Please note: This fee is REQUIRED to visit Devils Postpile National Monument. This year, Inyo National Forest will NOT accept Golden Age Passes and National Parks Passes that have the golden eagle hologram upgrade. ALL visitors to the Devils Postpile/Reds Meadow area pay this per-person user fee as soon as the road is open to the public. Fees are collected during the entire season. The mandatory shuttle bus, which runs from 7:00 am to 7:30 pm, is covered by this fee. Tickets are available at the Shuttle Bus Terminal at the Mammoth Mountain Lodge Gondola Building. The shuttle bus runs from mid-June until mid to late September. Exceptions to the mandatory shuttle bus include those visitors camping in the Devils Postpile/Red Meadow Area, overnight guests to Reds Meadow Resort, and disabled visitors. Hours of Operation: Summer season only. 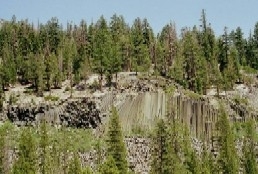 The opening date for Devils Postpile is June 27, 2006. It may close at any time after October 15th if a snowstorm occurs that accumulates on the road. Otherwise, the road will remain open until October 31 at 7pm, when it closes for the season. Ranger Station open from late June until early October, 9am - 4pm (closes for emergencies).